OUR MODEL HOME IS NOW FOR SALE! LOADED WITH UPGRADES AND PRICED TO SELL. 3 ACRE WATERFRONT LOT. DEEP WATER ACCESS, BERBER CARPET IN FROG, BEDROOMS & OFFICE, HARDWOOD FLOOR/LAMINATE LIVING ROOM DINING ROOM KITCHEN FORMAL ROOM HALLWAY HALF BATH UTILITY ROOM THREE-PIECE CROWN MOLDING THROUGHOUT FIRST FLOOR LIVING AREA, CUSTOM CLOSET SYSTEM IN MBR, GRANITE COUNTERTOP MASTER BEDROOM ON 1ST FLOOR, CERAMIC SHOWER IN MBTH, WITH SHOWER CADDY AND BENCH SEAT, CABINETS IN UTILITY ROOM, DORMER WINDOW IN BR, RECESSED LIGHTS THRU-OUT, WAINSCOTING TRIM IN DINING ROOM WITH SCONCES, HALLWAY, BEDROOM NUMBER ONE UPSTAIRS. HARDI-PLANK EXT SIDING, 12' X 15' SCREEN PORCH, 12' X 32' DECK, HARDI SHAKE STYLE IN MIDDLE GABLE, GUTTERS, BLACK ALUMINUM PORCH RAILS, UPGRADED WINDOWS 6/0, REFRIGERATOR INCLUDED IN SALE, FRENCH DOORS WITH TRANSOME IN DOWNSTAIRS OFFICE/LR, SLOW CLOSE DRAWERS/DOORS IN KITCHEN. A PRISTINE SHOWCASE OF THIS BUILDERS BEST WORK. THIS IS HOME! Send me more information about the listing at 2010 Anthony, Suffolk, VA 23432, MLS# 10239423. 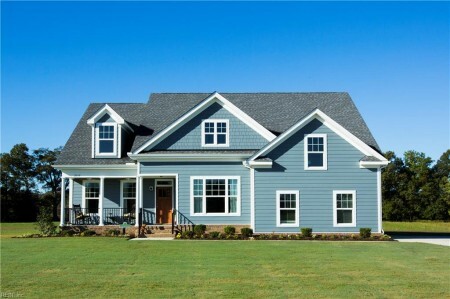 This 4 bedroom, 4 bathroom home located at 2010 Anthony, Suffolk, VA 23432 has approximately 3,570 square feet. It is currently listed for 498900.00 and has a price per sqft of $13,975. This home is currently Active under the MLS#: 10239423. It is listed by Fit Realty. 2010 Anthony, Suffolk was built in 2015. It has Garage Att 2 Car, Multi Car, Off Street, Driveway Spc parking. The kitchen includes Dishwasher, Disposal, Dryer Hookup, Microwave, Elec Range, Washer Hookup. 2010 Anthony is part of the Chuckatuck neighborhood located in 23432.